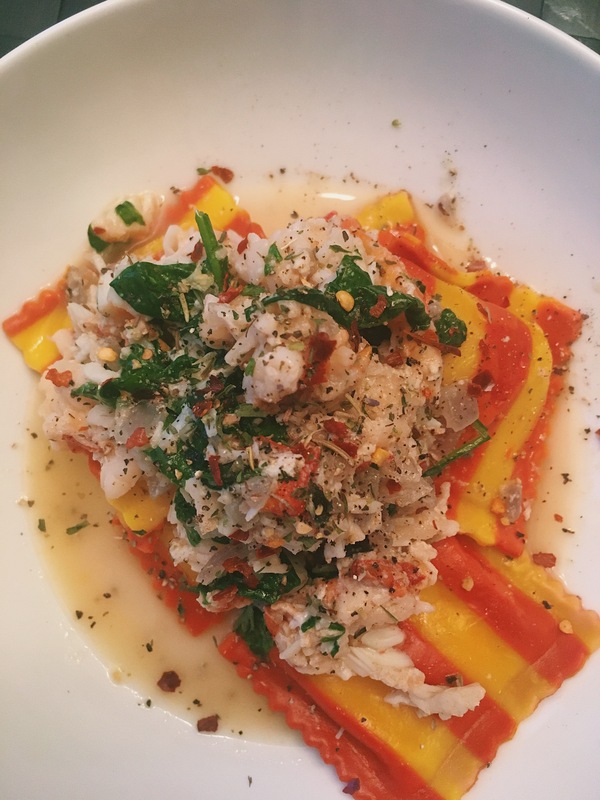 Cooking with your future Baby Mama: Lobster Ravoli | iamstylingonyou. During the week I try to cook everyday to save money and keep tabs on my glow up progress by paying attention to what I eat. With that being said, I also like to get my “Sandra Lee” on and try to finesse a pre made food item into something delicious, health conscious and fabulous. – Save about 2 cups of pasta water. *Saute onion until translucent and fragrant season with salt, pepper, and crushed red pepper. Add garlic and saute for 30 seconds. Add butter, 1/2 cup of your pasta water, and cheese. – Cook until sauce has reduced and cheese is incorporated. -Add your crab and lobster and saute in sauce until cook through. Add additional seasonings to your preference and add butter. Add in spinach and turn the heat off. Squeeze lemon, add zest, give it a stir and let stand for about 3 mins and serve with Ravioli.